I don’ t really care for the bloated kde or gnome desktops, especially on a netbook with limited memory. I have pretty much always been a fluxbox user since about 2003 or so. Over the years my configuration changes, partially because the way I do things changes. This means my fluxbox environment changes….but not too often. What bothers me is that sometimes I will lose the latest file for my fluxbox environment, as I often tweak it every couple of days. This used to be the case, but now pretty much everything goes to external backup in real time. But many people ask me about my fluxbox because it does look pretty damn nice, its very functional, and my entire computer runs in about 200MB of memory. So without further wait, here it is, complete with config files. 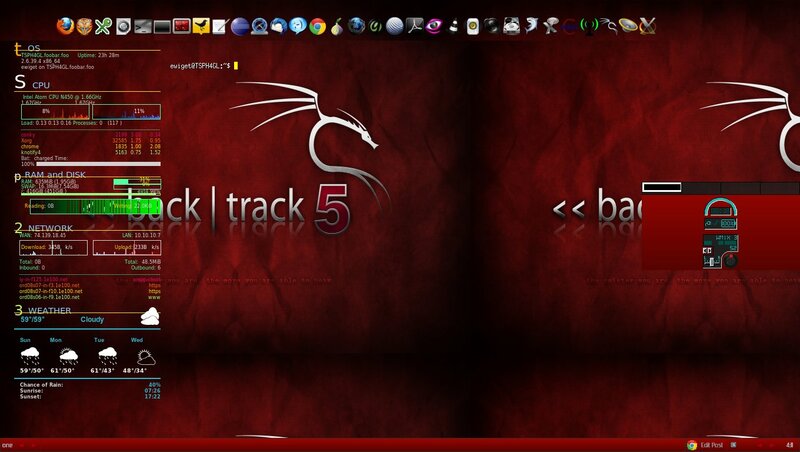 The first image below shows my fluxbox desktop. The middle image shows fluxbox with the slit showing that I have set to auto hide so its not viewable in the first image. The third image shows tmux running inside of an Eterm with two splits shown. I just started using tmux and it allows you to have multiple windows inside of a console or term window (sort of how you can split horizontally or vertically inside of terminator). I use the default bind keys in tmux, so not really anything I can tell you about it outside of providing you this link to the tmux cheat sheet. Basically, when I first startup fluxbox it loads conky as a system monitor, wbar for my most used applications, a borderless and transparent Eterm on layer 12 so its always available, and a slit containing fbpager, wmix, wmbattery. On the bar, I have the resapplet for setting screen resolution and a really cool fluxbox app called fbatterytool for suspend, hibernate, etc. Literally all of these apps should be available for most linux distributions. 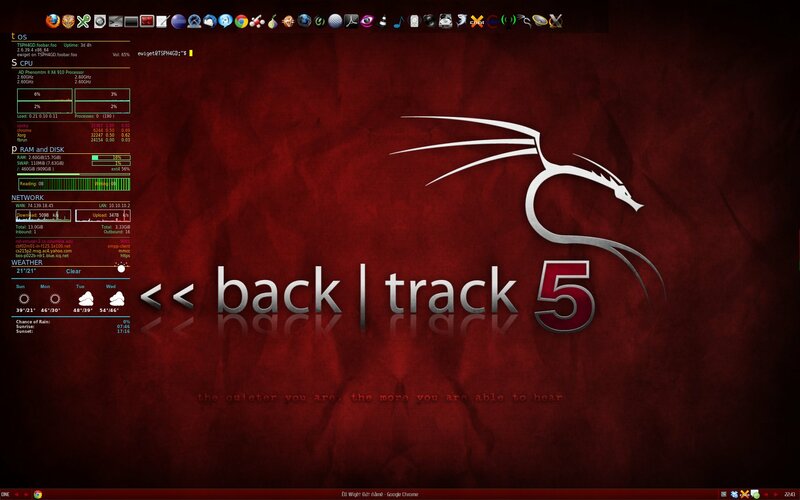 BTW, I use backtrack linux as my every day distro now (previously gentoo or sabayon with nearly the same applications for pentesting but they were harder to maintain and keep up to date). There are a few files I have edited in fluxbox. These are location in ~/.fluxbox folder. # I like it here. # with all the window decorations. None 121 :execCommand ~/scripts/pavol ! return c.split(" ").last.strip == "yes"
I have another script I use for when I disconnect the vga monitor while the netbook is turned on and it resets the lvds monitor to be the default. It also has a shortcut key in case you can’t see the console or even sometimes pressing alt+f2 tries to open the fbrun command on the monitor that no longer exists. The shortcut key is super_l + v (press the windows key on most keyboards plus the letter v). That script is called vga_off.sh and this is its contents. There is probably a few applications you may have trouble finding, for instance, I have two versions of mantra because I like the features of both but they do not contain the same features / extensions…so I keep both installed. 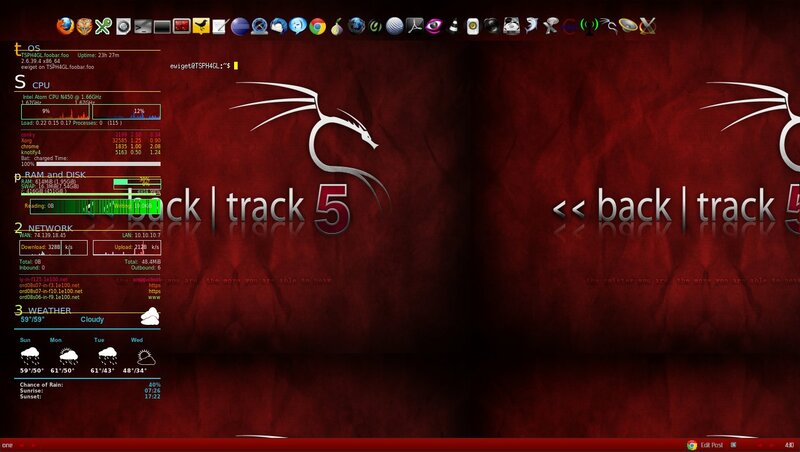 #wbarcommand="wbar -bpress -balpha 0.0 -zoom 1.8 -pos top -above-desk"
c: urxvt -e sh -c "cd /pentest/miscellaneous/utils/dragon && ./dragon ; sudo -s"
conky is configured with a file in your home directory called .conkyrc I found this file somewhere on the internet and modified it over the years. I don’t remember the exact areas I modified or who the original author was…..here is the file as it stands today. Inside of the conky config, it calls an external script for the theme used in conkyForecast (weather monitor). This is called conkyweather.sh and you will need to modify the path to it if you use this script. There is another script called inside the conkyrc file called amarok. I haven’t used amarok in a while and I am not even sure it still works, plus I have been too lazy to disable it. Here is the contents though…..